Water bottle with integrated hollow fiber microfiltration filter. BOTEOZ® is a portable water filter with 0.1 micron filter cartridge to remove turbidity and 100% bacteria and parasites instantly in any place. No chemicals, direct physical exclusion. When drinking from outlet orifice on bottle´s cap, water gets filtered instantly, no need to wait, by hollow fiber membrane cartridge with 0.1 micron porosity to eliminate 100% turbidity, bacteria (1-2 micron in size) and parasites such as Giardia, Amibas, Cryptosporidium (10-50 microns). 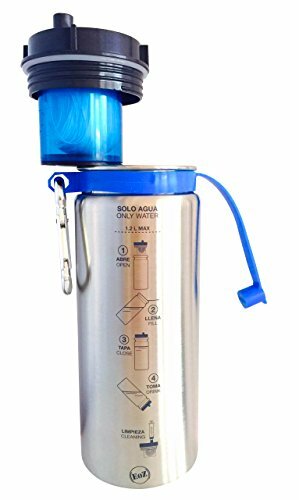 Bottle is of stainless steel to avoid use of plastic to store water, does not degrade with UV rays, does not give plastic taste to water and does not contain chemicals such as BPA. Bottle is heavy duty to resist falls and ensures long rated life. Microfiltration cartridge in cap lasts 20,000 gallons. Backwashing monthly with syringe provided with purchase. User´s manual is inside bottle. Efficiency certified by independent lab 100% bacteria and parasite removal throughout rated life. Cartridge easy to replace and available on Amazon. If you have any questions about this product by EOZ, contact us by completing and submitting the form below. If you are looking for a specif part number, please include it with your message.